We are a leading Manufacturer of automatic coffee grinder, coffee grinder machinery and coffee grinder for shops from Coimbatore, India. We are one of the well-known exporter, manufacturer, distributor, and wholesaler of Coffee Grinder Machinery for Food Industry. 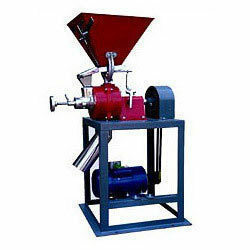 The offered coffee grinder machinery is widely used in the food industry for grinding of coffee beans. Our manufactured coffee grinder is made from food grade raw material and components, which are sourced from very reliable vendors in the market. Coffee Grinder Machinery having cast Iron steel body, adjustable lever for coarse to fine grinding having a large feeding hopper. Drive System: 1 HP motor is integrated in the bottom of the grinder and its concealed and base frame assy, suitable V- Pulleys, Belts, motor guard and necessary foundation bolts. We are instrumental in providing our clients with this exclusive medical range of Shop Grinder. The offered range of this coffee roasting machines is widely used in the coffee shops for making delicious drink. We also customize these machines are per the specifications defined by our customers. Customers can avail these machinery from us at the most industry leading prices.